in all it's 100+ Watts of glory! That...is...amazing... That wouldn't happen to be part of the truckload of stuff you are looking to get rid of is it?! 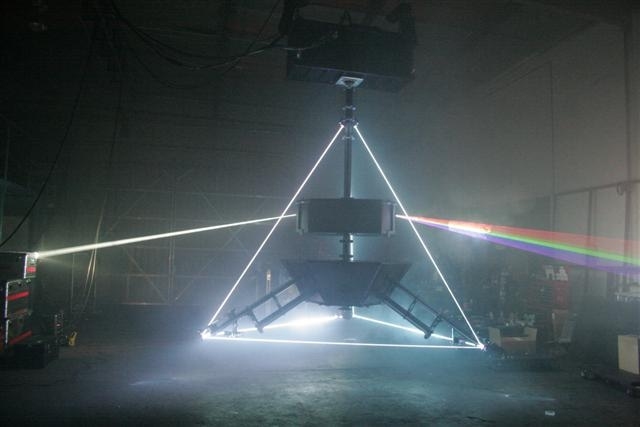 nope it just landed in the UK yesterday for Roger Water's short tour this year..
Well that is a very nice setup indeed. I'd love to see that in person someday. The guy who "designed" or helped design that "prism" was at the LDSI conference I went to late last year. I think it was last year. He was up in the "Pangolin" room upstairs and explained the whole set up they used on the RW tour. It looks very nice on the video he showed. Yes, that was George Dodworth the Owner of Lightwave International and the Prism. He is on Tour with Roger Waters with the prism as we speak. Everyone in the laser show biz was beating him up that week, it was kinda funny.